Santa, originally uploaded by punquin. I lazed around in bed this morning because I like to plan out my day in advance when I’m alone. I woke up at 10 am, but got up at 11. After I showered and dressed, I took the dogs out and fed them. My plan was to leave right away for Reston with Benny, but some girl pains hit and I had to take a moment to steel myself against them. When I felt ready to go, we piled into my car and went to fill the car with gas (and get me a hot beverage in preparation for being outside). It was a quick trip to Reston via the toll roads, and we arrived at 1 pm, as I’d hoped. We parked in a lot (I was worried Benny would spook in a parking garage) and walked into the Town Center. As soon as we stepped away from the shelter of the tall buildings, Benny freaked out. He is a wussy, and between all the people, cars, booths and the ice rink - he was overwhelmed. He was trying to back up and bucking on his leash. I immediately knelt down in the middle of the square to sooth and gentle him for a couple minutes. He sat and watched the people go by, and let little kids pet him (goldens are popular). I stood up and tried moving towards the ice rink again (we had to go through a narrow passage beside it) but he did another foot-plant. Luckily, I had stuck a squeaky toy in my purse for the car and hadn’t taken it out. I started squeaking that and it gave him enough of a distraction to move forward. We slowly lurched our way towards when a group of dog owners were standing. When I checked in for a photo, the volunteer (someone high up in the non-profit, I believe) remembered my name from the times I have volunteered and the adoption counselor training I’d gone through with them. We had a 20 minute wait in front of us and Benny was stressed and jerking around at the end of the leash. I went for an empty marble bench since it was easier to hold him still while seated. We sat and watched while about a dozen other dogs and owners waiting with us. After sitting on the bench with me getting hugs, Benny started to feel comfortable enough to say “hello” to some of the dogs around us. He was still stressed, but happy to be in one place. When it was our turn, we entered the building. It was the small lobby of an office building. They had a table set up for admin stuff, and Santa’s lounge was wedged in between the elevator doors. The photographer wasted no time in greeting us and undoing Benny’s leash. 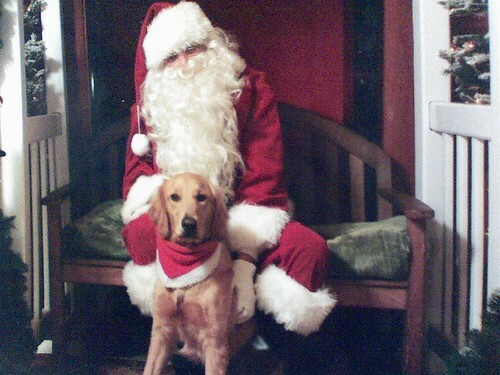 She walked him over to Santa and got him positioned with the Christmas bandanna I’d dressed him in draped just right. The photo session was only a minute or two long. Myself and an assistant stood behind the photographer squeaking toys. Benny watched us the entire time (with a very solemn expression) - except when someone squeezed by into the elevator. After that, it was back out into the cold to wait for our photo. I went back to the bench, and this time Benny laid calmly at my feet. The stress had zonked him out, so that he was the best behaved dog there. I, on the other hand, was standing out like a polarbear at the beach. Between the cold marble bench and my lack of gloves, I was starting to violently shiver. It wasn’t really bothering me because I knew I only had a few minutes longer to wait, but it sure concerned passersby. Luckily, Benny’s adorable photo and free doggy brownie arrived before I lost my fingers. We walked the long was back to the car to avoid the ice rink, with Benny pulling on the leash so hard it was as though the afore-mentioned polar bear was on our trail. But we made it back tot he car in one piece and took a moment to thaw out. After a stop at the very busy Target in Reston for a black purse and tampons, we zoomed on home. Benny went right to napping, and I took a hot bubble bath with my book. I got out at 4 pm in order to come down here and paint my fingernails for the party tonight. I’m waiting for the last coat of my sloppy French manicure to dry. Then I’ll need to hurry and get dressed. Above is a close-up of Benny’s photo taken with my camera phone. They will be emailing a digital version, then I’ll post that in my Flickr. Originally published at Stephanie's Thoughts. Please leave any comments there.